Quebec Liberal Leader Philippe Couillard was forced to defend his government's handling of the health network in the early moments of the first live TV debate of the provincial election campaign Thursday. His opponents reminded him of how nurses and orderlies are overworked and burned out, how elderly patients in long-term care facilities don't get enough baths and how medical specialists are overpaid, leaving less money for patient services. Couillard said "there has been more money than ever for home care" since his government's election in 2014, and he promised to hire more nurses and orderlies to give better services for patients. Parti Quebecois Leader Jean-Francois Lisee came out strong against Couillard, using his oft-repeated line of how the Liberal leader caused "human misery" in the early years of the Liberal mandate. Francois Legault, leader of the Coalition Avenir Quebec, which is riding high in the polls, hit Couillard hard on a recent agreement to pay medical specialists significantly more than their counterparts in Ontario. Legault and Lisee have promised to cancel the agreement and take billions away from Quebec doctors. "Doctors in Quebec were paid about 40 per cent less than in Ontario," Legault said. "Then you gave them a 60 per cent raise!" Manon Masse, one of Quebec solidaire's two co-spokespeople (the fourth-placed party in the legislature does not have leaders), said her party is the only one "with the courage" to collect more money to pay for services. Quebec solidaire's platform promised to find $13 billion more a year for the state, mostly from wealthier Quebecers and large companies. Following health care, the four leaders were to joust on education, the economy, and immigration. 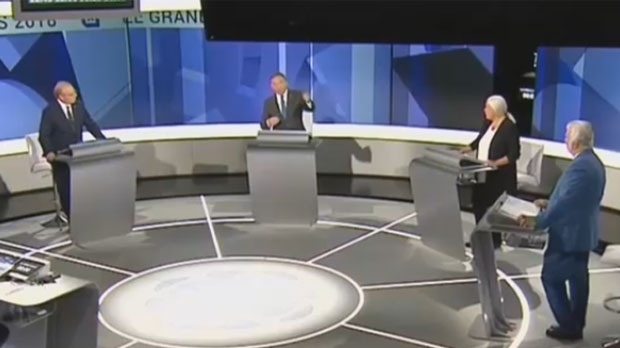 There will be two other televised debates -- one in English next Monday and another in French on Sept. 20.